Did God Abandon Jesus on Good Friday? Today Christians around the world celebrate Good Friday, the day we remember Jesus' death on the cross. In church services across the world the passions narratives will be read, preached about and perhaps even reenacted. It is a time to reflect on the events of the crucifixion and what it means for those who are followers of Jesus and put their hope in the promise that someday God will triumph over all. One part of the passion narrative that has sometimes caused difficulty for readers of the gospels is Jesus words "My God, My God, why have you forsaken me?" The words appear in Mark 15:34 and Matthew 27:46. Neither Luke nor John place these words on the lips of Jesus. In Luke Jesus dies with the words "into your hands I commit my spirit (23:46) and John has the simple words "it is finished" (19:30). Over the years I have heard, on more than one occasion, someone suggest that when Jesus cried out "My God, My God why have you forsaken me?" that God had turned his back on Jesus. That the father had abandon the son. 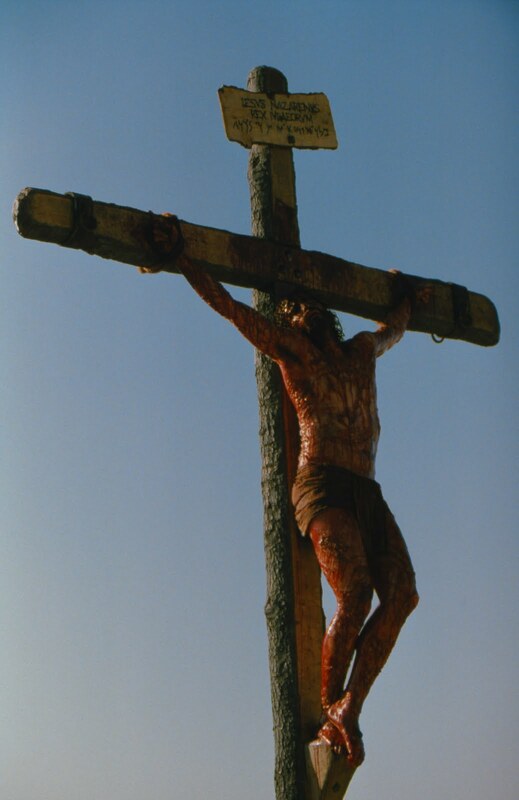 I have even seen passion plays where the figure of God is seen turning his back on Jesus as he dies. This of course leads to all sort of problems for our understanding of the trinity. How could the Godhead abandon one part of itself? I have heard some very "interesting" sermons based on the premise that God had abandon Jesus. But I don't think that is what is going on here. I don't think Mark and Matthew are suggesting that God abandon Jesus. I think they are saying something more theologically significant. In order to understand this passage we need to keep in mind that the words of Jesus in these two gospels are taken from Psalm 22:1. This psalm was often read alongside the crucifixion narrative by early Christians since the description of the psalmist's suffering has many similarities as that of Jesus. With that in mind it is quite possible that what we have here is not the last words of Jesus on the cross, but the theological interpretation of Jesus' death as understood by both Mark and Matthew. Since neither Luke nor John agree with Mark and Matthew about Jesus' last words it is quite possible that we don't know his exact words. But the use of Psalm 22 by Matthew and Mark is probably a way of explaining the story with theological significance. Psalm 22 begins with the same words asking why God has forsaken the psalmist and goes on to describe how everyone has turned against the author and how he is suffering and even dying. But the Psalm doesn't stop there. Beginning in 22:19 the focus of the psalm shifts away from the suffering of psalmist to the triumph of God over his enemies. The psalm declares how God will rescue those who suffer and how those who have been rescued will declare throughout the earth what God as done for them. A psalm that begins with a cry of anguish and despair ends on a note of hope and triumph. If we understand the last words of Jesus in Mark and Matthew in the context of Psalm 22 we realize that Jesus is not wondering where God has gone but is rather declaring the coming triumph of God. Although things may look bleak now, ultimately God will triumph and that good news will be spread throughout the world. God did not abandon Jesus. More important on this Good Friday is not the idea of God abandoning Jesus but triumphing overall. That which begins in defeat and despair ends in hope and victory. I have yet to see any episodes of the History Channel's miniseries The Bible. It's not that I am boycotting or otherwise avoiding the series. It's not that I am uninterested or theologically or philosophically opposed to it. No it is something darker and even more sinister. I am one of the few Americans who refuses to pay for cable television. That's right, not only am I unable to watch the Walking Dead, I am also not one of them! I will get around to watching the series at some point in the future. 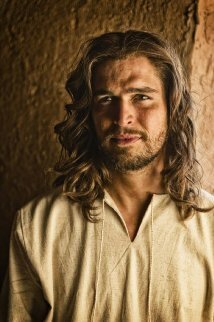 I have an interest in the way the Bible is portrayed in film. But I won't pay to do so via cable nor will I purchase it when it comes out on DVD. I will wait until my public library has a copy and then I will borrow it. Over the last few weeks I have heard both good and bad about the series. There are lots of opinions and you know the old saying. But one take on the series that I enjoyed was that of Stephen Colbert. He seems to not like the series. Or to be more precise, I don't think he likes the hype related to it. See what you think. Education and the Future: Online or Classroom? Education is changing and at an amazing pace. Correction, the world is changing at an amazing pace and education is trying to catch up. The technology boom that began in the early 1990s with the internet has touched everything we do in life. On more than one occasion my wife and I have asked: "what did we do before Google? How did we get information for, say, a vacation!" Well, quite often we called a number. Need to know the weather for a trip in Phoenix? Call the weather! Need flights to Phoenix? Call the airline directly. And if you want to compare flights you had to call them all. After looking in the phone book, mind you. Want to get a campsite at a national park? Call a special 800 number that would then give you the number for that park. And on and on it went. It was how we lived. We didn't know any better. We were the masters of our destiny and it was only a phone call away. Little did we realize just how much the internet would change things. I can now compare flights to Phoenix, book a hotel and get the weather all at one website. This means not only do I get the information I need quickly and efficiently, it also means that the travel industry has changed tremendously. There are few "travel offices"anymore, which means even few people are needed to staff them. People don't need them to book a vacation when they can do it all online. They are still using their phones, but oh how those phones have changed. Education is changing too. I began teaching my first online course in 2009. In many ways I was Johnny-come-lately for this form of teaching. One reason I delayed was that I hadn't yet been convinced of the need. My classes were always full and there didn't seem to be a need. With the economic contraction of 2008 I was forced to join the ranks of those who teach courses online. I have to admit that I was surprised how much I enjoyed it. I discovered that I was able to deliver a better course to my students. I was able to be more creative and diverse in the way that I present information and the students seemed to benefit from the experience. What I missed, and still miss, however, is seeing student faces and getting to know them. I have had students in online classes that I have never met and wouldn't know if they knocked on my door. I have tried and have yet to to discover a way to make community online. And students have reflected that same concern to me. They like being able to "attend"class when they are ready, but miss being able to ask questions during a lecture. And like me they feel the isolation of being alone and apart from a group. Now with the debut of MOOCs, I suspect that the feeling of isolation will only grow. In light of this, I thought I would share some articles that have come to my attention recently. The first is a letter from an online student in theology. He has experience in both online and traditional and ends up voting for the traditional. There are however disadvantages too and two in particular stand out. First the sense of student isolation must never be underestimated. If peer group pressure can be difficult to negotiate peer isolation can be an academic disaster. No matter how much self-confidence one has, the nagging doubt about what others are making of this issue saps it. 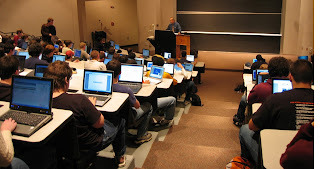 Just a few months in a class of fellow students has reinforced my belief that ‘wondering what others think or are doing’ is a necessary and desirable condition in all students as much ‘learning’ takes place in informal discussion with fellow students (and even more so with staff) in an unthreatening environment. An email simply does not perform this function, even if one is fortunate enough to receive a reasonably fast response (not too likely to be the case in my experience). The second is an article that notes how many students that enroll in online courses are bored and not finishing the course. Part of the problem seems to be that instructors have merely repackaged the classroom in an online format which is sort of like when Saul tried to get David to wear his own armor. It doesn't work very well. Hundreds of courses are now available from dozens of the world’s best universities and professors. There’s been a steady stream of glowing public relations and growing credibility among employers. There’s even an acronym for massive open online courses that’s gone mainstream: MOOCs. The four major MOOC platforms (Coursera, edX, Udacity and Udemy) have attracted at least 4 million sign-ups to date. Many of those people are working adults looking to pick up new technical or business skills, or update old ones, in order to advance their careers. So far, though, online courses are not building a massively better-skilled workforce.Sure, a few free, open, online courses have generated eye-popping registration numbers, upwards of 200,000 in some cases. However the average enrollment for MOOCs is more like 30,000 to 50,000. The real problem, though, is that more than 90% of these would-be learners don’t finish. Many don’t even start the courses for which they are registered. And a lot of those who finish don’t take another one. That means the number of people actually learning anything substantial is much less massive than the PR suggests. The third is a short article that talks about how 72% of professors don't' think students should get credit for online courses. Obviously I don't agree, but it does raise some questions about what is happening in the way we deliver information. 72 percent of professors who have taught Massive Open Online Courses (MOOCs) don’t believe that students should get official college credit, even if they did well in the class. More importantly, these are the professors who voluntarily took time to teach online courses, which means the actual number of professors who discount the quality of MOOCs is probably much (much) higher. The survey reveals the Grand Canyon-size gap between the higher-education establishment and the coalition of tech companies and lawmakers that are mandating college credit for online courses. The future of education will certainly be very different. But I wonder if we are experiencing the upswing of the pendulum at the moment and once the "novelty"of online has worn off and economic factors have improved, if you we won't see a swing back to a traditional form of education that has been radically reshaped by our current experiences. This evening at sundown Jews will begin celebrating Passover. In honor of the holiday I am posting this video by the Maccabeats in which they combine the music of with the story of Israel's exodus from Egypt. For other great Jewish Holiday songs by the Maccabeats see their YouTube Channel. With thanks to Bob Cargill and James McGrath.